Gardeners have grown plants successfully for generations by comparing information with neighbors and choosing plants that flourish in their immediate areas. However, gardeners who want to try new plants imported from other areas generally want some assurance that the plant will thrive in their gardens. One of the most critical considerations is whether or not the plant will overwinter successfully - that is, will it survive through the coldest part of the winter in its new home? The USDA Hardiness Zones were developed to help gardeners answer that question by mapping the lowest winter temperature in each region of North America. Each color represents a zone with an average lowest winter temperature, shown in the key. An interactive version of the map, which allows users to pinpoint locations more exactly, has also been prepared by the USDA. Each zone can experience a range of 10 F (5.6 C) degrees variation in temperature. For example, the coldest average winter temperatures in zone 5 are -20 to -10 F (-29 to -23 C). Some zones show 5 degree F variations in average temperature by indicating subzones a, which are the colder parts of the zone, and b, which are the warmer parts of the zone. Gardeners outside North America can use planting recommendations based on USDA zones by comparing local low temperatures to the ranges in the chart. When you are ordering plants, check the recommended hardiness zone to see if the plant will survive in your area. Remember, however, that your yard may form a microclimate, an area that is colder or warmer than the rest of the zone. Also, keep in mind that winter survival is not the only factor that will determine a plant's health. 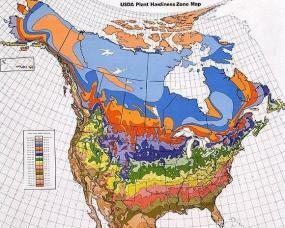 The USDA published its first hardiness zone map in 1960 and updated it in 1965. The 1990 map was completely reorganized based on data collected between 1974 to 1986 in the United States and Canada and between 1971 to 1984 in Mexico. The 1990 map was created because "in North America, the ranges of temperature and moisture for the past decade were wider than those recorded for the 1940's through the 1960's," according to the USDA. That trend seems to have continued. The USDA and the American Horticulture Society worked together to develop a newer map based on records from 1986 to 2002. This map shows many regions are approximately 10 F warmer than they were in the 1960's.